Hi guys! 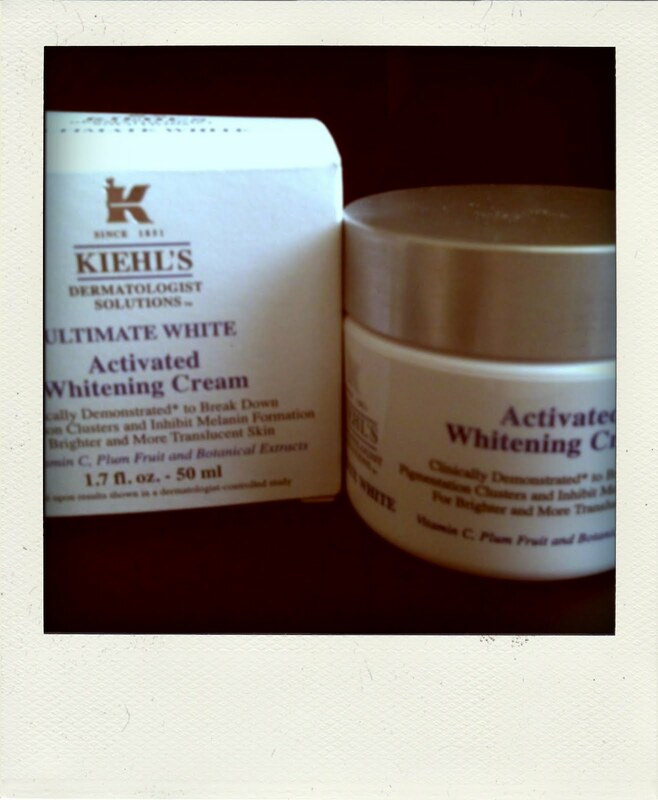 I have another product to review today - the Kiehl's Ultimate White Activated Whitening Cream. This cream is the latest addition to Kiehl's Ultimate White collection, which was launched in Spring 2010. This product was kindly sent to me for consideration and review purposes. I've been using it for a few weeks now, and I would LOVE to love it! From the press release: "Triple Vitamin System" helps to break down pigmentation clusters and inhibit melanin formation for brighter and more translucent skin. Skin-nourishing ingredients help repair and antioxidants help protect the skin barrier. According to the press release, this line was formulated specifically to meet the needs of Asian skin. This cream comes with gorgeous simple packaging - the kind that makes you think you're buying something environmentally friendly, and really good for your skin, LOL. It comes in a tub, with a screw-on lid, but doesn't come with a spatula for hygienic purposes like some other companies do. I LOVE the smell of this cream! It's the kind of smell you get when you walk past a facial center, if you know what I mean. It's sooooooo amazingly calming and refreshing! I'm a total smell nut, so this is a MAJOR selling point for me! This cream is thick, but not so thick that it doesn't absorb into the skin immediately after application. However, I have found this cream is pretty heavy for my oily/combination skin. You'll see why below. I was so impressed with the performance of this product! Within days, I noticed a wonderful luminescence to my skin. It was brighter, clearer, and glowing! I also have a few pigmentation spots on my cheekbones (which I hate), and they have lightened considerably. I freaking LOVED the effect this cream had on my skin! Unfortunately, after 2 weeks of using this cream, I started breaking out. At first, small, red bumps started appearing underneath my skin. Then, these large, cystic pimples started appearing. You know, those huge painful ones that appear underneath the skin and take MONTHS to disappear. I was so disappointed that I broke out! If I didn't, I would definitely have continued using this cream, because I was loving the results! I'm not sure if this cream was the exact cause of my breakouts, it may have just been the hormones, so I'm going to try this out again, once I get my skin back in check. I may have made the mistake of wearing this cream both day and night, which might have been a little bit heavy for me. I have oily/combination skin. My cheeks are normal (not dry), and my T-zone is extremely oily. I am very congested on my nose and chin areas. If you have dry skin, I highly, HIGHLY recommend this cream! It performed amazingly! If you have oily skin, I probably recommend using this only once a day, at night. If you're interested, this cream retails for AUD 65 at Keihl's counters. The lovely Jen from My Funny Valentine has alerted me to the presence of an ingredient that might be the cause of my breakout - propylene glycol. Jen has mentioned that she reacts badly to this ingredient, as do a lot of others.